Through hearing we are connected with everything that surrounds us. Yet millions of people, young and old, suffer from hearing loss, which disrupts this special connection not only with our surroundings but also with our friends, loved ones, and coworkers. As Anton Stucki reveals, onset hearing loss as well as other conditions of the ear canal, such as tinnitus, industrial hearing loss, and vertigo, are not part of our normal physiological aging process. The brain is naturally able to compensate for hearing loss, even in situations with loud background noise, yet as we age, we lose this adaptive ability. In this step-by-step guide, Stucki explains his revolutionary hearing recovery system, complete with detailed instructions for 20 simple, practical exercises you can do at home to improve your hearing and train your senses. Drawing from physiology, biology, physics, psychology, trauma therapy, and brain research, he goes beyond the mechanical notion that damage in the ear is responsible for hearing loss and shows that hearing recovery is possible in many cases. He shares stories from people who used this method to compensate for deafness in one ear, even after multiple unsuccessful surgeries, and others who have been able to ditch their hearing aids completely as well as the positive effect restored hearing has for patients with dementia and Alzheimer’s. He explains how the program does not regenerate inner ear growth directly--the practices work by developing and training your perceptual system to be able to grasp whole meaning from incomplete or partially understood information. Thus the system also helps you establish contact with your inner self and enhances the brain’s self-regulation of all five senses. Exploring the mind-body role of consciousness and belief on overall health, the author reveals how onset hearing loss can be a manifestation of an inner state of imbalance, driven by emotional causes and stress, and how finding the “triggering event” stored in our bodies and dissolving the trauma surrounding it can help restore your hearing. 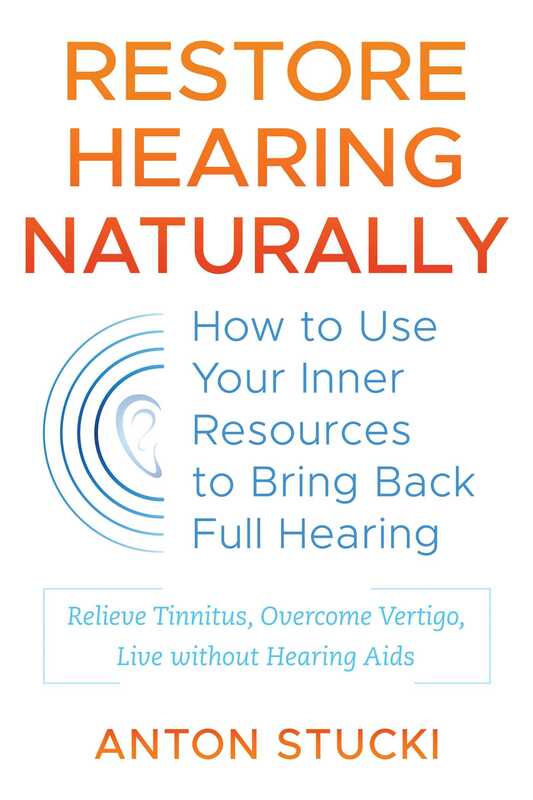 Offering a way to reconnect with the sound environment around us and enhance our inner and outer senses of perception, Stucki shows how improving your hearing can also restore balance to our overall health physically, emotionally, and mentally. Any biological being has the ability to heal itself. We all experience this every day. We stub our toe on the table leg, cut our finger, or knock our ankle against the wall. It hurts, maybe it bleeds, but it immediately compels our body to heal itself: After an injury, the body, from its inherent ability, immediately starts the regulation and regeneration process. This capability is part of all living things. In this book, we consider that process under the special perspective of hearing: why do we hear worse, why we no longer hear as before. What are the causes of hearing loss? How can we have the ability to regenerate and regulate our whole system--including our body with all its features, our soul, and our mind? A healthy system responds and always works as a whole. If parts are affected, will this impact the whole? The practical approach presented in this book is novel, unconventional, and connects different areas of knowledge in the fields of physiology, biology, anatomy, physics, psychology, trauma therapy, field theory, and brain research. The approach goes beyond the purely mechanical notion that damage to the mechanism in the ear--for example, bent hairs in the inner ear--is responsible for hearing loss and prevents hearing improvement. Sounds constantly change and influence our lives. They determine how we feel, whether we relax or go on alert. Our whole system of perception is always included and involved. My hearing is constantly “on.” Even when I sleep, I react to noises. We don’t stop listening. As soon there is an unusual sound, our bodies awake. Our consciousness constantly scans the environment by hearing--hearing never sleeps. By listening, we want to understand--what are we hearing? We listen to each other, we listen to ourselves. We want to understand in ourselves what the world “out there” is telling us. This is a very complex process, in which many aspects of our senses interact and work together. Our task, therefore, is to learn to hear again. We can rebuild our sense of hearing again by training the acoustic detection and processing of auditory information in the brain. For this we don’t need to regrow or replace anything. The hardware or the physical components of our sense of hearing are just as they are right now. Our task is to fully and correctly use this existing hardware again. How and why this works is explained in this book. Precise instructions for training can be found in Chapter 5 as well as complementary strengthening exercises in the following chapters. This test works best with a running water tap, so that we can reliably vary the volume and strength of the water jet. When testing with a tap, water is consumed. I am aware of that, but in my opinion, the end justifies the use of this resource. Also, the costs are manageable, at least in developed countries. • The person sits relaxed and comfortable in the training area. The companion sits opposite them on a chair. He has pen and paper ready to record important observations and answers. The faucet is off. • The attendant asks the person to close their eyes. Then he quietly goes to the faucet and slowly turns it on, just a little. • As long as the person does not hear the water noise significantly, the faucet is continually turned on more in steps. For this, the companion goes to the faucet to open it up a little more, and then back to the chair opposite the person and the question is asked again. This process is repeated until the person can hear the water running very clearly. • The volume can be increased by, for example, placing a pot under the faucet, or else something else "tinny," which amplifies the sound. • If you’ve reached a volume in this process that is well heard by the person, compare this volume with that of a normal conversation. If the water noise is louder, this indicates a weakness of our sense of hearing. • What is the position of the head? • Is the head straight? • Is the head is rotated and / or held at an angle? • Are the shoulders about the same height or is one higher than the other? A different strength of the left and right auditory perception, a unilateral hearing loss, is almost always reflected in a more or less imbalanced posture and body geometry. Usually, a specific ear is rotated forward, usually the “stronger” ear. In particular, if the head isn’t directed straight forward, this is considered a very strong indication that a listening field--one side--is stronger than the other. This relationship of imbalance and hearing will be further investigated in the 3rd level test. Anton Stucki is an audio expert, well known in Germany for his hearing recovery system. For over 10 years he has helped thousands of people restore their hearing and has trained medical practitioners and therapists to use his system. He lives in Brandenburg, Germany.